The eight people who came together at Arnold Air Force Base on a mid-summer’s day in 1951 to pool their savings and create a credit union probably never imagined the impact their actions would eventually have on the lives of thousands of people in the state of Tennessee. The organization they created evolved into the largest credit union in Middle Tennessee and one of the largest federally-chartered institutions of its kind in the United States. Its birth was inauspicious. In June of that year, President Harry Truman had dedicated Arnold Engineering Development Center (AEDC) at Arnold Air Force Base in Tullahoma, Tennessee. The dream of the eight original founders began with a desk in the corner of the Benefits Office of Arnold Research Organization at AEDC. Membership in the credit union was open to the civilian employees and commissioned officers at the Base. In the decades following its inception, the credit union experienced flourishing growth as membership eligibility expanded and additional financial centers were built across the state. The lobby at the Nashville-Charlotte Ave. facility is open and inviting. — Daniel C White Photography . In 2006 the credit union’s Board of Directors voted to change the organization’s name from AEDC Federal Credit Union to Ascend Federal Credit Union. The reason for the name change was to better differentiate the credit union and create a cohesive, recognizable brand in a crowded financial marketplace. A strategic plan was developed that included building new financial centers and remodeling existing ones to fit the brand. 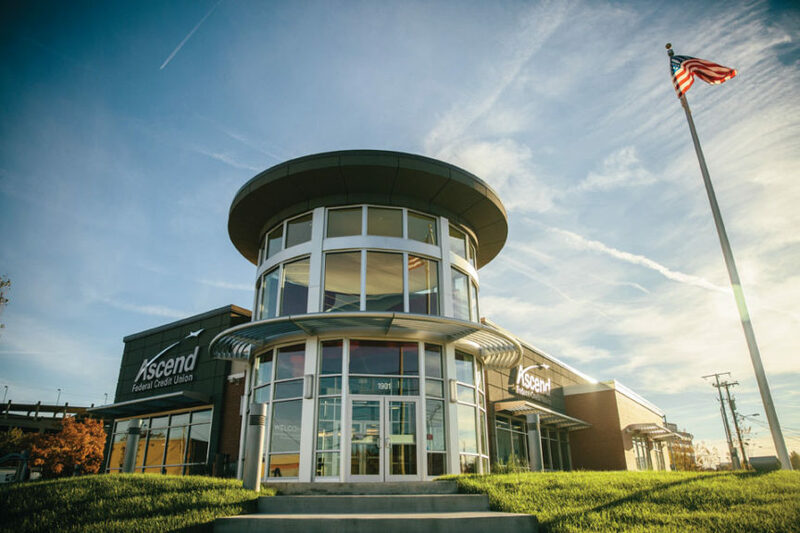 Today, Ascend operates as a non-profit, full-service financial institution that provides checking and savings accounts and a complete range of loan products. With generally better rates and fewer fees than their competition, Ascend is able to offer its members numerous free services such as an app for mobile devices, electronic bill payment, youth accounts, financial education seminars, and much more. 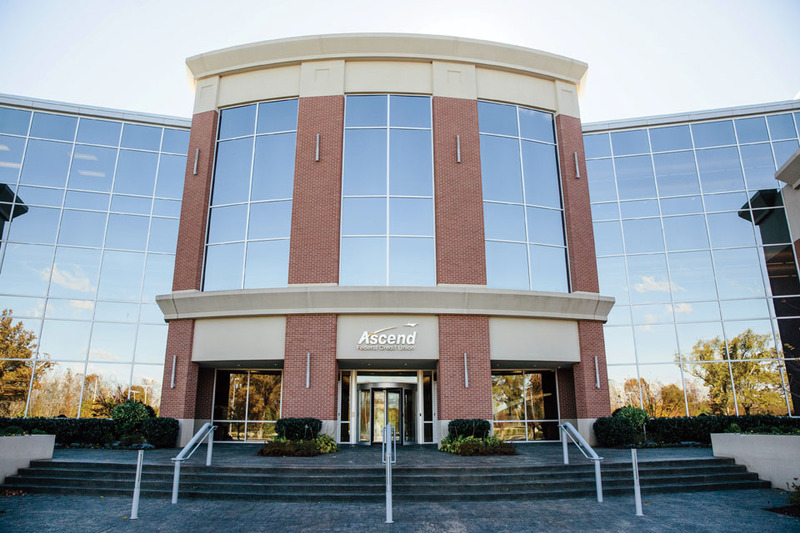 Ascend currently has 17 financial centers in Middle Tennessee, including three in Nashville. The Corporate Headquarters, located in Tullahoma, Tennessee, now houses 17 departments. Ascend is guided by a volunteer, unpaid Board, some of whom have served for more than three decades. Their goal, and that of each of the 348 full-time and 64 part-time members of the Ascend team, is to enhance members’ lives with superior financial products delivered with service excellence. The Board is focused on positioning the Ascend brand for growth within a defined market area that includes 16 counties, many of which are in the Davidson County Metropolitan Statistical Area (MSA). 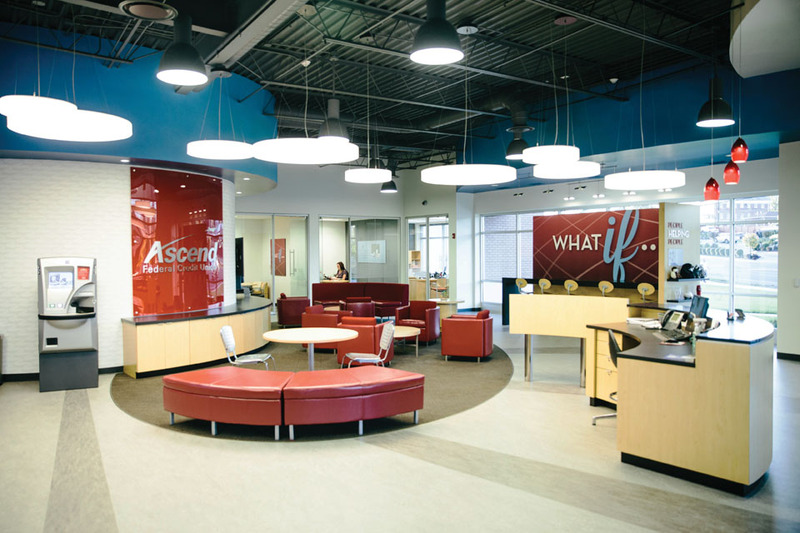 The goal is to establish Ascend as the financial institution of choice in Middle Tennessee. As visitors enter the Nashville West financial center, they are immediately greeted by a device bar and two PASSports. Ascend’s brand promise is to educate and help members become effective financial stewards. This promise is delivered by representatives asking questions and offering their full, undivided attention to understand each member’s current life situation and future plans before offering solutions. 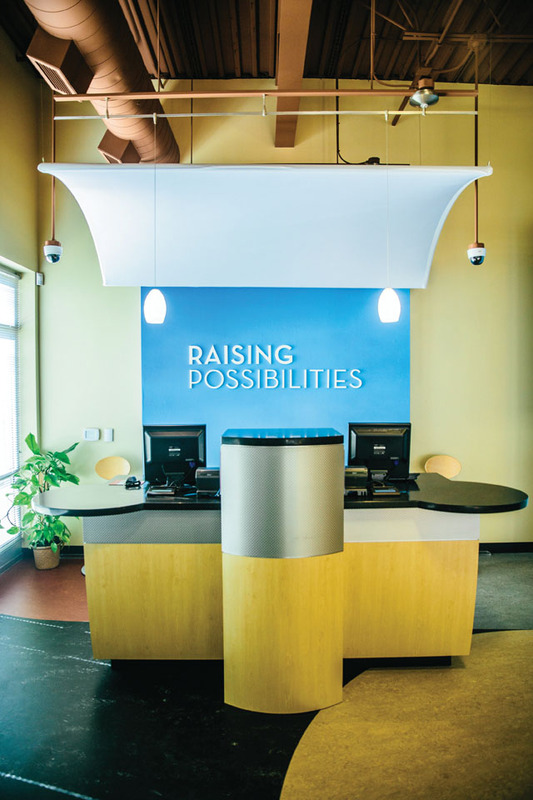 Ascend’s tagline, “Raising Possibilities,” represents a desire to help members recognize and raise all their possibilities as they are assisted with personal financial solutions. The credit union’s corporate headquarters is located in Tullahoma. Ascend is also no stranger to Middle Tennessee’s music scene. It sponsors Music City Roots and Bluegrass Underground, and, in 2015, the credit union secured the naming rights to Nashville’s newest outdoor entertainment venue, Ascend Amphitheater. 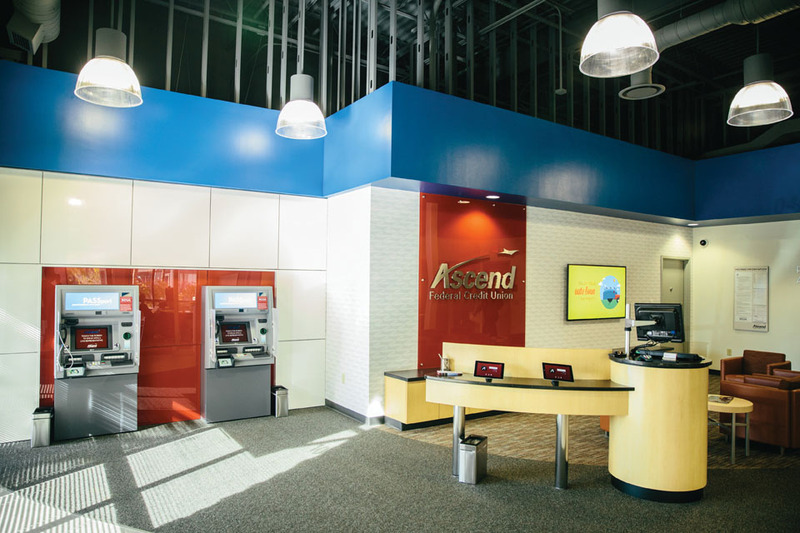 Teller pods like this are common place at Ascend financial centers as they are a friendlier and less constrictive alternative to traditional teller windows. “Harmonizing the Ascend brand with Nashville’s beautiful new amphitheater is paramount to achieving our strategic intent of being recognized as Nashville’s credit union,” Gabriel noted. “We recognize music as a medium that brings people together. Memories will be made here, and we want to be part of that.